Abigail Kent, winner of the American Harp Society’s coveted Concert Artist award for 2017-2019, has come a long way in the mere eight years since she picked up her instrument. Currently on the road throughout the U.S. and Canada giving recitals and masterclasses, she is simultaneously pursuing a master of music degree at the Mannes School of Music at the New School, where her teacher is Emmanuel Ceysson, principal harp of the MET Orchestra. Initially, Kent resisted learning the harp. “I thought it was all about girls with long hair and ball gowns, rainbows and ponies,” she says with typical humor. She was first introduced to the instrument in the first grade, when her teacher’s mother brought in a small Celtic harp to show the class. Without access to her own instrument, much less a teacher who could show her how to play it, she turned instead to the piano. It wasn’t until harpist Judy McCoy moved to Charleston, SC, two years later, that she began to study the instrument. She started with the lever harp* and, after five years, turned to the larger, more complicated pedal harp** when McCoy offered to lend her her old instrument. “I became fascinated with how it worked and fell in love with its strength and power. I started practicing a lot, six hours every day,” says the 23-year-old Kent. Her perseverance paid off. 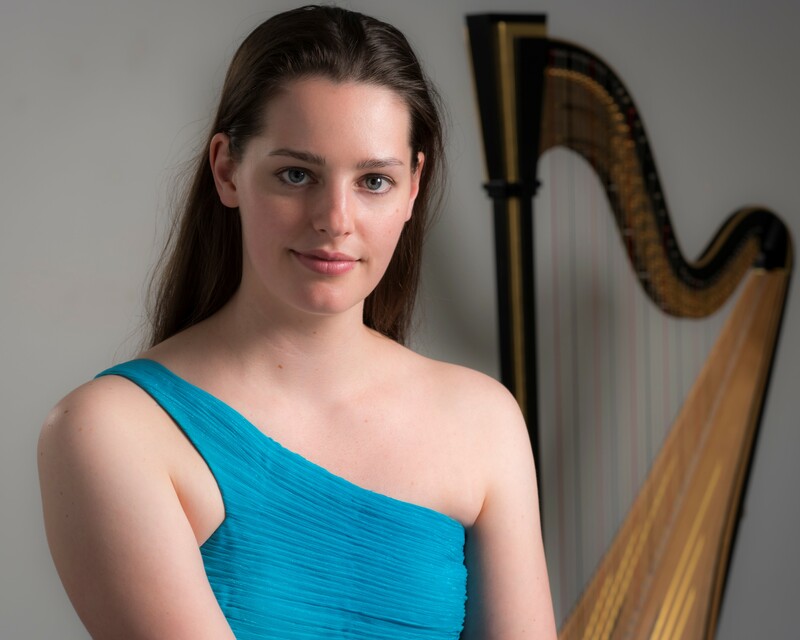 “In my more than 45 years as a harp teacher, I must say that Abigail is one of the most talented and hard-working students to grace my studio,” remarked Jacquelyn Bartlett, another of Kent’s early teachers. By the time she graduated from Curtis, Kent had won a number of competitions. She was a finalist at the 2016 International Harp Competition (Hungary), laureate finalist and Senior Division winner of the 2015 American Strings Teachers Association National Solo Competition, semi-finalist in the Chief Musician category of the Third Wales International Harp Competition in 2014, and winner of “Play with the Pros” Concerto Competition and performance with members of the Philadelphia Orchestra at the 2013 Saratoga Harp Colony. She was also a featured harp soloist at the 2017 World Harp Congress in Hong Kong. Kent’s infectious enthusiasm and sense of humor have taken her far in eight short years. What inspires her to work so hard? “When you find something that fulfills your life, it ceases to feel like work. I love the harp and I love practicing it. I feel like I can do this the rest of my life.” Inspiring words for us all. Laura Sherman, harpist for the Broadway show Wicked, is an active performer, writer, editor, and harp music publisher. Her articles have appeared in The American Harp Journal, The World Harp Congress Review, the Historical Harp Society’s Bulletin, and the Harp Column magazine. She also recently served as the Interim Editor of The American Harp Journal. *A lever harp is a small harp that uses levers instead of pedals to change the pitch (i.e. to create accidentals). Because of its small range (between two and six octaves) and restricted chromatic options (it cannot play in every key), its repertoire is limited and often consists of folk, Celtic, or modified classical pieces. It is frequently referred to as the Celtic harp. **A pedal harp is a more modern instrument that uses seven pedals located at the base of the instrument to create accidentals. The single-action pedal harp, which was invented in the late 17th century, allowed harpists to play in more keys than the lever harp, but the double-action pedal harp, invented in the early 19th century, finally allowed harpists to play in all keys. (Its range is six and one-octaves, just short of the piano's seven-octave range.) A rich body of repertoire has been written for this instrument, now the standard harp for solo recitals, chamber concerts, and orchestra and opera performances. It is also referred to as the modern concert harp, double-action pedal harp, or simply, the classical harp.